May 8, 2018 By This post may contain affiliate links. Celebrate your grad’s commencement by serving a batch of Graduation Cupcakes at the graduation party. 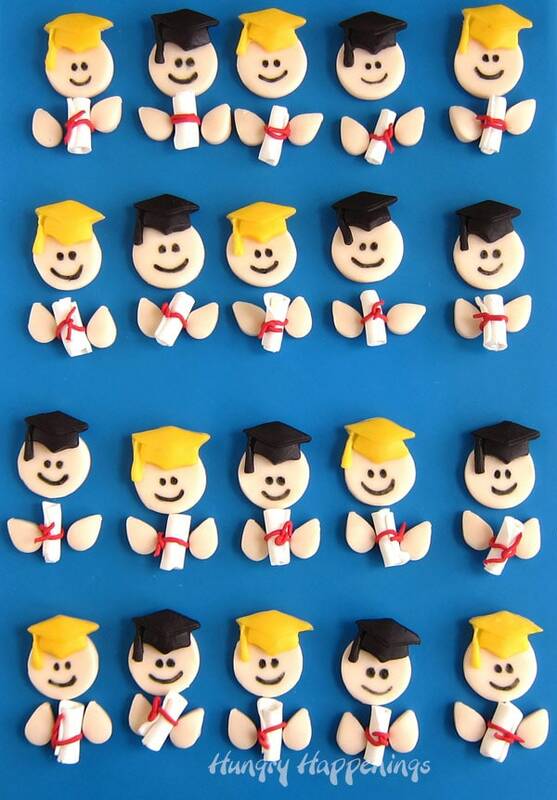 Each little cake is decorated with a frosting graduation gown topped with a modeling chocolate graduate wearing a mortarboard and holding a diploma. 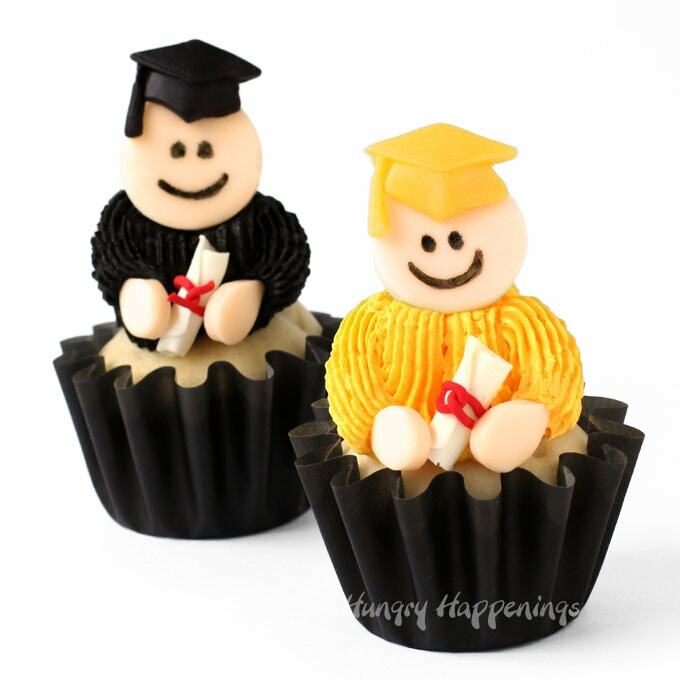 Graduation day is such a momentous occasion, so make it extra special by baking and decorating these Graduation Cupcakes to serve at the graduation party. I’ve created desserts for many graduation parties over the years and I can’t believe I have never thought to make these graduate cupcakes before now. Aren’t they cute? They would make a fantastic centerpiece display on your dessert table, especially if they are showcased on Wilton’s 4-tier Stacked Cupcake and Dessert Tower. How amazing will this look on your table at your graduation party? 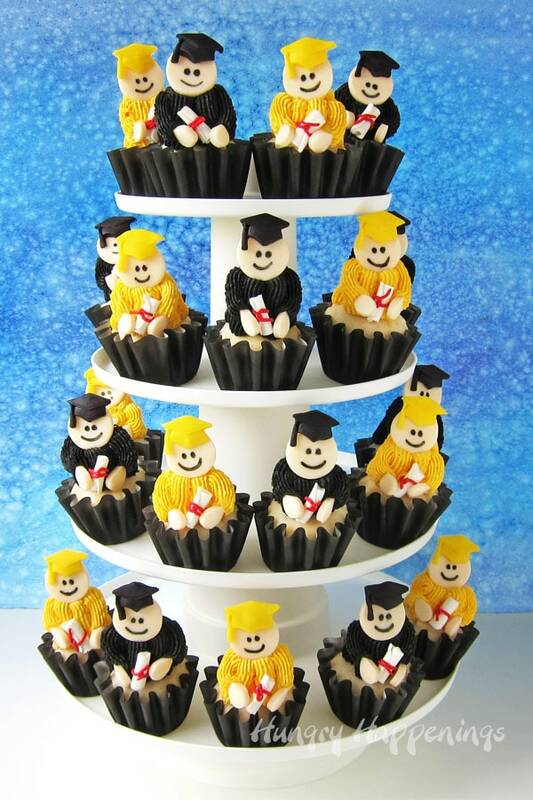 The tower is lightweight yet sturdy, measures 12 by 12 by 16-1/4 inches when fully assembled, and can display up to 36 of these graduation cupcakes. The display is simple to assemble and it’s nesting design allows for compact storage, which I love. I’ve not ever hosted a graduation party at my own house. I’ve always had to transport my graduation desserts to other locations, so I love that I can easily take this display along with me, quickly assemble it on-site, and arrange my cupcakes or other desserts on the four circular plates. What color will your grad be wearing at his or her commencement ceremony? Black is the traditional color but many schools provide their students with caps and gowns in their school colors. 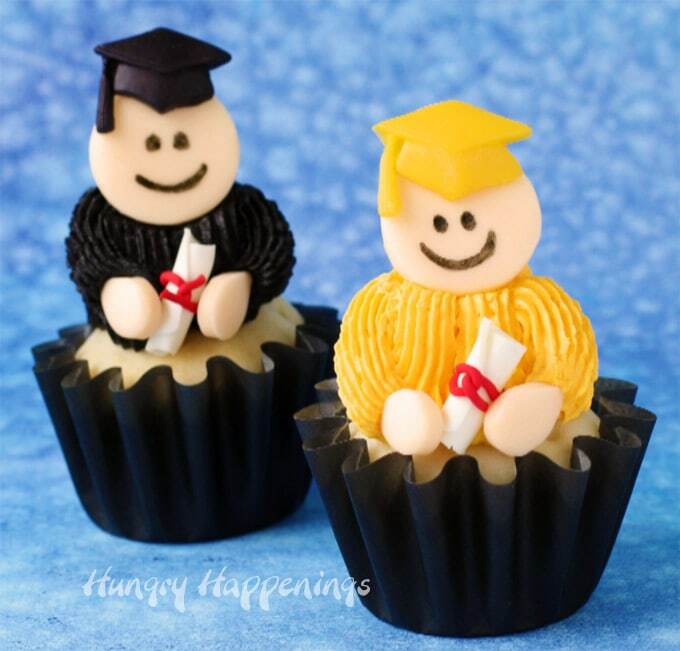 I wore a yellow gold cap and gown when I graduated from high school and black when I graduated from college, so I chose to use those colors when creating these cute cupcake graduates. 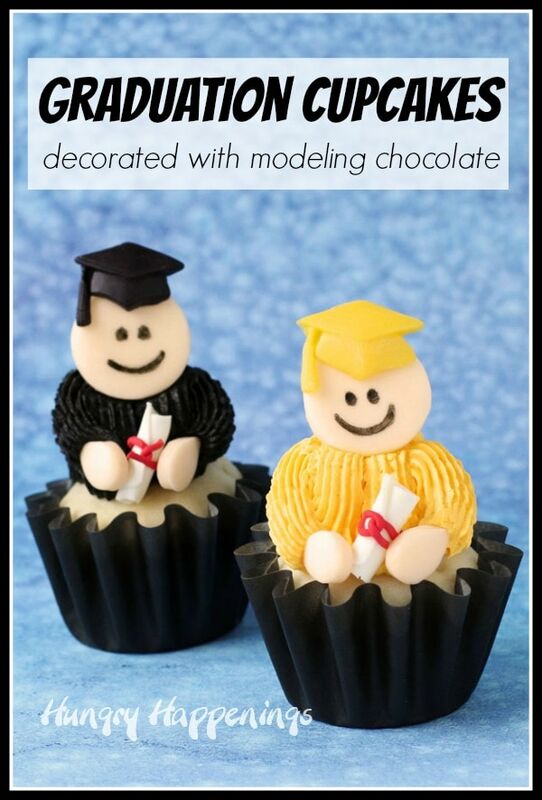 Fortunately you can create these graduation cupcakes in just about any color by using Wilton’s food coloring. Wilton sent me a Colorful Icing Decorating Kit, complete with a tub of their newly formulated White Creamy Decorator Icing, two boxes of 12 (16-inch) disposable pastry bags and a box of primary and pastel Gel Food Colors. I used the yellow from the primary color box to color my frosting to get just the right color for my graduation gowns. You’ll want a nice firm consistency to create the bodies of the graduates, so add 2 tablespoons of sifted powdered sugar to each cup of frosting to achieve a stiff consistency. One cup of frosting will decorate about 8 cupcakes. NOTE: Wilton recently removed all the partially hydrogenated oils from their products, including their Decorator Icing, so the new icing has a different consistency and flavor than the previous version. Color the icing using Wilton’s Gel Food Colors. For each cup of frosting I used about 15 drops of the yellow coloring. Adjust this to achieve your desired color. Blend colors together if your schools colors are not available (ex: mix blue and red together to get purple). To make black icing, you can add 2-3 tablespoons of sifted cocoa powder to the white icing instead of the powdered sugar then add black food coloring. Add drops of the yellow coloring to your white modeling chocolate and knead until well blended. Be sure to wear food handling gloves when coloring your modeling chocolate. OR you can use Yellow Candy Melts to make Candy Clay (the same recipe as modeling chocolate, only made using Candy Melts). Pinch off a tablespoon sized piece of the white modeling chocolate and add a drop of light yellow and light pink. Knead together. Then knead small pieces of that peach color into more white modeling chocolate until you achieve your desired skin tone. For darker tones, add some milk or dark modeling chocolate. Pinch off about a tablespoon of white modeling chocolate, add a few drops of red gel color, and knead until well blended. Add more color if needed. (commission earned for sales) or at craft or discount stores. *You’ll need about 1/2 ounce of modeling chocolate per cupcake. See my Modeling Chocolate Tutorial for tips on coloring white modeling chocolate or making it using colored candy melts. I was compensated by Wilton and given free products in exchange for sharing this tutorial with you. All opinions expressed here are my own. Roll out skin toned modeling chocolate to about 1/8th inch thickness and cut out 1 1/4 inch circles. If you roll out your modeling chocolate (candy clay) on a silicone baking mat using a silicone fondant roller you don’t need to use any cornstarch or powdered sugar. If you roll it out onto a cutting board, lightly dust your work surface with cornstarch or powdered sugar so it won’t stick. Press modeling chocolate into silicone graduation cap molds. Allow to dry for 5 minutes then remove. Use clear piping gel to attach one grad cap to one skin tone circle. Use a candy decorating pen to draw a face onto each circle. Roll the white modeling chocolate out as thin as possible to make the diplomas. Cut into 7/8 inch by 1 5/8 inch rectangles and roll up forming diplomas. Press red candy clay through a clay extruder fit with a single hole. Cut the thin logs into 2 inch strips, then wrap around the diplomas, cutting off excess. If you don’t have a clay extruder you can roll the red modeling chocolate into thin logs to be wrapped around the diplomas. Break a cookie stick in half and insert it into the center of a cupcake. I baked my cupcakes in Wilton’s Wave Baking Cups. You can buy cookie sticks at the grocery store in the International Food aisle. They come filled or dipped in chocolate. Pipe stripes of frosting from the cupcake to the top of the stick. Use a Wilton 4B pastry tip to get the grooved stripes like I did. The cookie stick will give your graduates structure and help to hold the bodies upright. Pinch off small pieces of skin tone modeling chocolate and shape into hands. If you prefer, you can roll out the modeling chocolate and use a small tear drop cutter to cut them out. Attach one head, two hands and a diploma onto each cupcake. You can find more amazing dessert and appetizer decorating ideas over on Wilton.com. Have fun making your Graduation Cupcakes. If you recreate these and share them online be sure to link back to this tutorial, mention Hungry Happenings, and use #hungryhappenings. 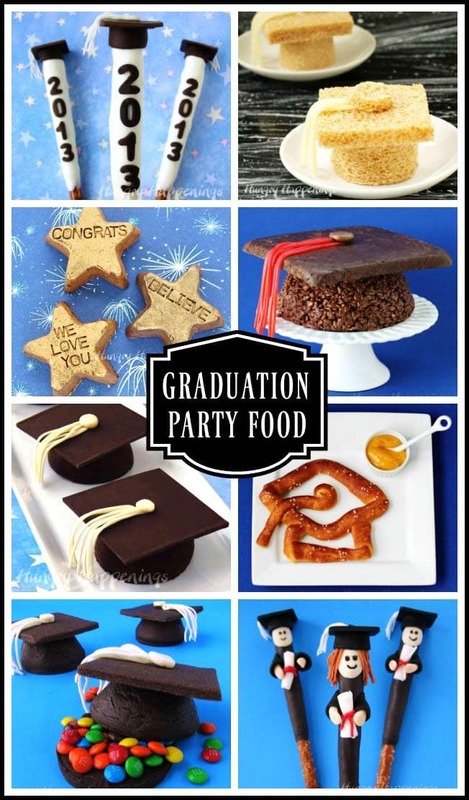 See more fun food for your graduation party here. I know of so many grads who would just love to see these at their celebration! Thank you Karen. All these little graduates looked so cute on the cupcake stand. I’m glad you like them.